Change the look of your Mac. Developer website: Interacto Labs Inc.
Is there a better alternative to Flavours2? Is Flavours2 really the best app in Desktop category? Will Flavours2 work good on macOS 10.13.4? Flavours Lite is an application to change the operating system's appearance in a fast, easy, and safe way. Applying a theme is only mouse-click away. Flavours Lite was designed and built from the ground up for OS X 10.10 Yosemite. It features a completely rethought user experience through a new elegant UI, and introduces a new lightweight, fast, safe theming engine. Light - Lightweight engine with overall better system performance. Fast - Fast theme generation, fast theming engine, and apply themes instantly (no need to logout to see changes). Note: Flavours 2 Lite is a paid upgrade. Existing Flavours 1 licensees are eligible for an upgrade at a discounted price (50% off). Safe - Seamless system integration, no system files modified on disk. 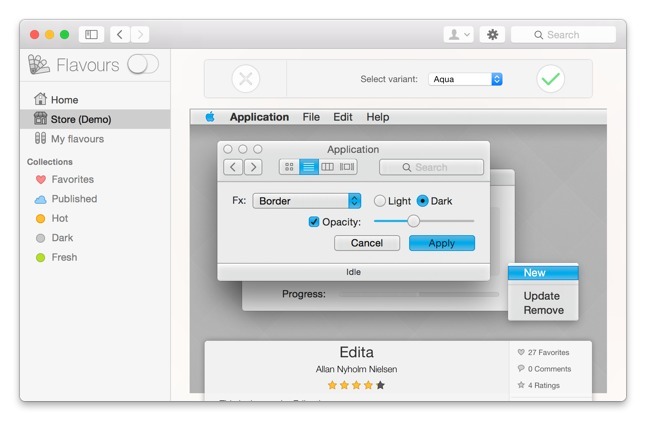 Themes - Bundled with a hand picked fine selection of 128 themes (+variants) for OS X Yosemite. Variants - Choose from multiple artistic variations. If you are running older OS X versions (10.7, 10.8 or 10.9), check Flavours Classic, which allows users to create, apply, and share themes (flavours-classic.interacto.net).